Do you have trouble self-promoting because you feel it is too much like bragging? As children, we are often taught that no one likes a braggart. As a result, women may feel that they have to refrain from promoting themselves. 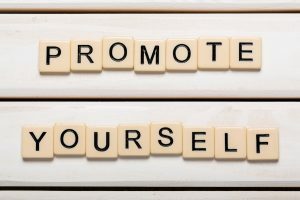 In the professional world, we must promote ourselves if we want to move forward. In some cases, our work speaks for itself, but in many cases, if we do not self-promote, people will never know who to credit for the great job. Why are women hesitant to self-promote? Females are often taught that “tooting their own horn” is a negative and a form of conceit. We have been brainwashed that appearing strong willed, experienced, and skilled is rude and brash. Unfortunately, this prevents women from moving forward and gaining the higher level positions or raises. By being truthful through self-promotion, you are making a positive statement about yourself. Despite what you may have learned as a child, there is a difference between self-promotion and bragging. It is a very fine line. Self-promotion is about emphasizing the facts to prove what you are stating. For example, stating that with you as leader, your team managed to turn 5 new clients over the last month. It is proving that you have a track record of leading teams to success by showing how many of your team members are in the top 10 in sales for the quarter. Accurately announcing goals reached and improvements that have occurred because of you, your knowledge and confidence should proudly be displayed on social media or other avenues connected to your career. Bragging, on the other hand, involves making ourselves better than we are. We “puff” ourselves up to be greater than the quality of our work and others, and make claims with no hard data to back them up. 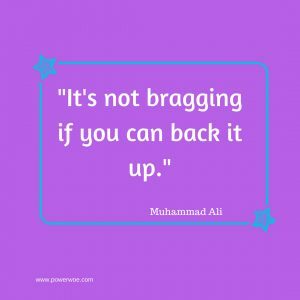 Ultimately, bragging is creating a false narrative to make us seem bigger and better than we are and in most cases is due to insecurities. Let’s examine the scenario of your team bringing in 5 new clients over a period of a month. Bragging would be that you, alone, were responsible for turning the new clients, while self-promotion relates that under your leadership, your team achieved this. Do you see the difference? Using our other example of having the most team members in the top 10 in sales for the quarter, a braggart would give herself all the credit for those quarterly sales statistics. The self-promotor gives the credit to her team for their hard work, which under her coaching, enabled them to move into the top 10. Discover your strengths and own them. Make sure you are seen for your talents, and let others see you using them. Don’t be afraid to speak up in meetings and contribute ideas. Volunteer at a company event where you will be seen by upper management. Establish yourself as a thought leader in your company by writing articles for LinkedIn or your company newsletter, making sure you share them with your boss. having each other’s back, it allows both of you greater positive exposure. Stop downplaying compliments!! Rebuffing compliments is another thing women have been taught to do. We are socialized to be modest and humble. Instead of saying “it’s nothing”, accept and own the compliment, looking the person straight in the eye and saying thank you. At the same time, give credit where it’s due to others for their successes and thank them for their hard work that has helped you move forward. Don’t hesitate to keep track of career accomplishments. Create your own kudos file where you keep your contributions, awards, education, training and more. Unfortunately, many women don’t start this until it’s too late and they have forgotten more than they remember. Keep a running list of everything you have accomplished in your professional career. This way you have back-ups of anything you bring up in a performance meeting or interview. Keep learning. In today’s environment, technology is always changing and not keeping abreast can stall your progress. See if there are new courses, degrees or certifications you can take to improve your potential for promotion or leadership. Keep track of every course or certification you have as this may help your case for promotion or locating a new position. Don’t be afraid to speak up in meetings. Give suggestions for improvements or recommendations for new solutions. If you have a specific knowledge base, don’t hesitate to bring it up if it fits with what is being discussed. And don’t sound hesitant or unsure of your remarks. Speak with authority and be strong about the potential for success with your ideas. Remember that it is not possible to change learned behaviors overnight. However making and practicing these changes can cause an improvement in your professional life. Try one tip at a time and see how it works. Slowly add in each different tip and see where it leads. Mastering the art of self-promotion is a sure way to move from one professional stage to another.